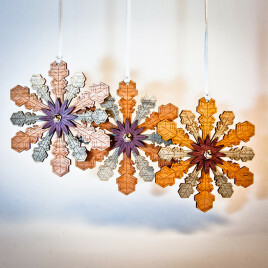 View Cart “Snowflake Ornament – Wood” has been added to your cart. The patterns for these note cards are original and inspired by nature. These patterns were developed through a process known as "Nature Patterns" where a natural item, in this case the blossom of an Aloe plant, is geometrically analyzed and then reconstructed in an abstract form. With the addition of "Merry Christmas!" 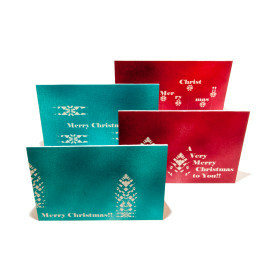 engraved in playful locations, this set of cards is sure to make your friends and family smile! 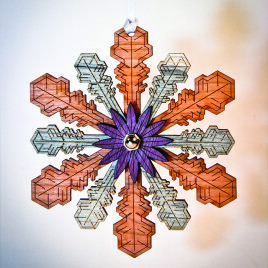 Reclaimed wood is cut into delicate shapes to create these multi-layered snowflake ornaments. 3 layers held together with an ornamental bolt and hung from white satin ribbon. The pattern is designed from an image of an actual snowflake! Woods include Beetlekill Pine, Oak, Cherry and Purple Heart. Composition of wood species varies depending on supply.